Michele's Top Ten Places To Shop At WDW! Michele’s Top Ten Places to Shop at WDW! Oh boy. Just writing the name “Mouse Gear” brings a smile to my face. Sigh… I just love that store. I think Mouse Gear at Epcot is one of the best stores on Disney Property. Why? Well, they have a huge variety of merchandise for just about every occasion you can think of. They have a whole section of Epcot/World Showcase themed items, with the countries represented in Mickey heads, etc. Those items can’t be found anyplace else, not even Downtown Disney, so if you see something you like there, it’s best to grab it. Other than the Epcot themed souvenirs, you can find something for just about anyone on your souvenir buying list. Mouse Gear offers items for the kitchen, clothes, jewelry, stuffed animals, toys, candy, pet souvenirs and even stickers and decorations for your car. If you’ve never been to Mouse Gear, I highly recommend it, it’s just awesome. Mouse Gear is located toward Test Track and Mission Space, across from the Electric Umbrella. I think every Disney go-er knows of the World of Disney store in Disney Springs, formerly called the Downtown Disney Marketplace. It’s like Mouse Gear on steroids! It’s the largest Disney store around, and they have the place sectioned off so you don’t get lost or forget where you already looked. Each section has a theme….. the middle has the current year’s Disney themed items, like mugs, hats, shirts, etc. As you branch out, you will find an area for each member of your family, and then some. There’s a spot for boys, girls, women, men, scrapbooking, collectables, kitchen items, jewelry, etc. You name it, it’s there! I love to hit World of Disney just ONE more time before leaving our vacation. It’s a great last stop, just in case there was something I missed or if there was someone I forgot to buy for. It’s dangerous in there, I warn you, but so worth the stop, or multiple stops in my case! If you’re shopping at the World of Disney store at Disney Springs, they I’m sure you’re familiar with Basin, as it is right next door. You probably can smell Basin before you see it! Basin carries a huge variety of bath products that are amazing to say the least. They have bath bombs, cut soaps, bath salts, shampoo bars, body butter, and massage bars, among other things. The prices are pretty reasonable too, which helps. I always stock up on my bath bombs every time I visit Basin, because I know it will be awhile before I get them again. You can order from Basin online, but it’s not the same as the hands on experience, and sampling the products yourself. If you try the products at Basin, you’ll be hooked, they’re wonderful! Yes, the Force Awakens is the hot topic currently, so Star Wars merchandise for the ENTIRE family is a must. What I like about Watto’s Grotto, is the fact that they have a lot of Star Wars merchandise for women. Usually, the choices for Star Wars loving gals are limited, but not at Watto’s Grotto! They have a huge variety of shirts, dresses, hoodies…. and they also have the Her Universe line! It’s a win-win for everyone in your group! If you’re a sucker for animal prints, then shopping at the Island Mercantile at Animal Kingdom is the place for you. In all fairness, any store at Animal Kingdom is pretty good, but I digress. I love the animal print themed items, like shirts, towels, picture frames, etc. Just like with the World Showcase specialty items at Mouse Gear, Island Mercantile has that same type of thing, just with animal printed flair. I go through different phases, and choose one item to collect from each park, lately it’s been beach towels. I love the one I got at Animal Kingdom, it’s just black with a huge tiger printed Mickey head, and you can only find it AT Animal Kingdom. It’s fun to find items that are specially made for each park, it’s like a reminder of where you were, a mental souvenir if you will. Island Mercantile is a great place to shop! Like most Disney-goers, one of my favorite places to shop on Disney property is the Emporium at the Magic Kingdom. The Emporium is the first shop you’ll see to your left when approaching Main Street USA. Yes, the Emporium starts at the front of Main Street, but it stretches all the way down to the back towards Cinderella Castle. In the Emporium you can find a huge variety of Disney souvenirs that will be pleasing to any member of your travel group! From clothing to jewelry, from mugs to photo albums. Guests can find just about anything at the Emporium. It’s also my last stop before leaving the Magic Kingdom at night. I love to take one last walk through, just to make sure I got all the MK goodies that I wanted! The Emporium at Magic Kingdom Park is most surely a must do! Located inside The Living Seas with Nemo at Futureworld, is The Living Seas Shop. If you’re a fan of Nemo and friends, then you’ll love this store. Not only does it have a great theme to go along with the surroundings of the Living Seas and all the entertainment it has to offer, it’s a cool place to hang out on a hot day and browse through some Nemo and sea creature themed merchandise. Don’t forget, inside The Living Seas, there are some great photo opportunities there, like sitting inside Bruce the Shark from Nemo! Fish are Friends, not food! 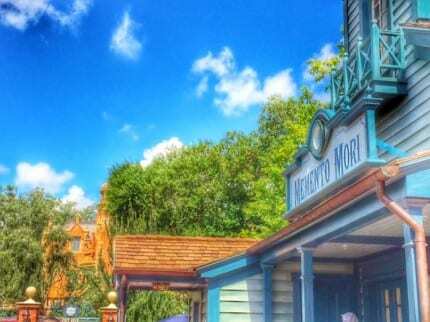 Welcome Foolish Mortals, to Memento Mori…. the first souvenir store devoted entirely to the happy haunts of the Haunted Mansion. This long awaited store was opened in October of 2014, and has been a guest favorite. You can find plenty of Haunted Mansion themed items for the home, men, women, kids and accessories. Guests can also get a “ghost” transformation photo taken for $19.99, they are really cool. If you hadn’t gotten the chance as of yet to visit Memento Mori, make a plan to stop by the next time you’re at the Magic Kingdom. Be sure to save up, you’ll want a TON of what they have to offer! It’s no secret, I love shopping at Disney Springs. There are so many fun and unique things through the various stores to check out. One store that I’ve grown to love is Tren-D. Tren-D is a Disney fashionista’s paradise! They have many current trends, with a Disney flare to them. Tren-D carries brands like Dooney and Bourke, Beautifully Disney Cosmetics, and Disney Couture. If you’re looking for some fashionable fun with the latest trends and styles that include a Disney touch, then Tren-D is a place you’ll want to make a stop at. It’s really fun! Being a Mom of two boys, one store that we always have to stop at is Tatooine Traders at Hollywood Studios. Located at Star Tours, Tatooine Traders is a Star Wars fans must do shopping spot. Here, you can find a huge assortment of Star Wars souvenirs, including action figures, game sets, stuffed animals, shirts, key chains, etc. Also, guests can build their own Light Saber! My boys did the build your own light saber thing, and they loved it! If you’re a Star Wars fan, then Tatooine Traders is a place that you’re sure to enjoy! May the Force (and your wallet) be with you!